On Tuesday, I linked a post to an article entitled “The Gospel According to Wolfwood.” The author of that original piece makes several comparisons between Wolfwood and Bible characters, and I’m expanding on one of her allusions – to Simon Peter, in relation to Vash/Jesus Christ. In the Trigun anime, Nicholas D. Wolfwood first appears as a traveling priest who is raising money for orphans. But we soon find out that’s he more than he seems as the literal cross he carries becomes a devastating weapon called a Punisher. Wolfwood is a sure shot and a dangerous man, unafraid to kill when the situation calls for it. 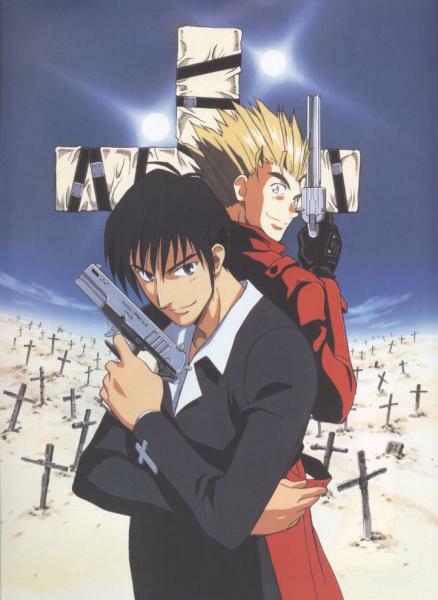 As the series progresses, Wolfwood becomes closer and closer to Vash the Stampede, the series protagonist and his equal or better at gunfighting. Vash is a feared gunslinger who has caused unimaginable destruction on his adopted planet. As the two men bond, Wolfwood is troubled by Vash’s non-killing ways, which he regards as naive. Eventually, Wolfwood must make a decision about whether to follow his friend’s path or to continue on the one he’s lived for so long. Jesus and Peter are the odd couple of the Bible. Jesus is patient, commanding, peaceful, and in control, while Peter is impetuous, violent, and wildly emotional. And yet, Jesus addresses Peter consistently and specifically throughout scripture and the fisherman was one of the LORD’s closest friends, even after his denial. Vash and Wolfwood are opposites in many ways as well, demonstrated best in their approaches to violence. Both fight for the greater good, but Wolfwood is willing to take lives, while Vash has vowed not to kill anyone (who can forget his moniker, “love and peace!”?). Jesus and Peter also varied on how they approached violence. Jesus did not advocate overthrow of Judea’s Roman oppressors and did not lead a revolt, as some wanted. Peter, on the other hand, was a Zealot – a revolutionary who meant to take up physical arms in expelling the Romans. Like Wolfwood, Peter may have grown up in an atmosphere where violence was celebrated. When Jesus was betrayed by Judas, Peter used his sword to cut the ear off of a man in the arresting group. Jesus, again showing his opposition to the physical violence, restored the man’s ear. Peter’s rash nature is also seen in his direct interactions with Jesus. He was unafraid to chime in when he disagreed with Jesus. This divide between doing the will of God v. the will of man, and of a revolution of the heart v. a revolution of a physical nature marked the relationship between Jesus and Peter. Similarly, tension builds between Wolfwood and Vash, and it reaches a climax when they are fighting Zazie the Beast, a Gung-Ho Gun who appears to be a child. During a battle between Zazie and Vash, Wolfwood protects Vash by killing Zazie. Vash had developed a relationship with Zazie and is betrayed by him, similarly to how Jesus was betrayed by a close friend in Judas. And in both situations, violence occured – Peter slices off Malchus’ ear and Wolfwood kills Zazie. These words and the scene are reminiscent of Peter’s similar declaration. In response to 16:21-28&version=NIV">Jesus’ prophecy about His own death, Peter replies, “Never LORD! This shall never happen to you!” His exclamation is almost saying, “You can’t be serious! How can you say such things?” Wolfwood and Peter appear to be realists, while Vash and Jesus seem to be idealists. In the end, though, both of the hotheaded realists come to understand in their hearts that their friends were right. Peter overcomes all of his faults to become a “rock” of Christianity, while Wolfwood makes a fateful decision to avoid killing. Ultimately, both die for their “faith,” demonstrating that ideas neither could fully understand eventually became the driving forces of their lives. As a christian, I had a crisis of faith once and somehow found myself watching some episodes of Trigun and watching this show helped me get through it. I’m a very strong christian now and though I still question god’s plan I don’t have that nagging fear anymore. More than one person has brought up Trigun as an example of a series that has many themes that Christians can take to heart. I’m glad that you were able to grow through you struggles, partly through watching this wonderful series. There’s so much to learn from it! Very well written. Will be using this in my panel next week 🙂 Thanks Charles, good comparison, never saw it like that but as soon as I saw “Jesus/Peter – Vash/Wolfwood” I already knew exactly where you were going with it. Thanks for the kind words! Wolfwood is certainly one of the few characters in anime that can be analyzed through a Christian lens on both a superficial and much deeper level.